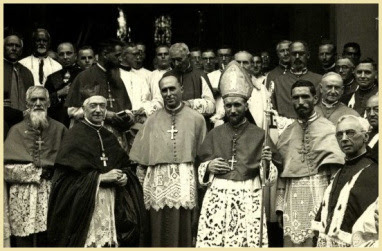 As envisioned by Archbishop Lefebvre in its statutes, the apostolate of the Society of Saint Pius X is the restoration of the Catholic Priesthood and the preservation of the Holy Sacrifice of the Mass. These ends were clearly on His Grace’s mind when he gave this sermon at the Society’s International Seminary of the Holy Curé of Ars (Flavigny, France) on February 2, 1988. The occasion was the Feast of the Purification of Our Lady on which date seminarians were tonsured and received the clerical habit known as the “cassock.” The Order of Tonsure is the official public act of the Catholic Church making a man a cleric. In reading this sermon, who can deny that Archbishop Lefebvre was a prelate sent to the Catholic Church to restore the spirit of God’s priests? I am glad to give the cassock, the clerical habit, and particularly to give the tonsure to those who entered last year, thereby marking the official entry into the clergy and preparing them to receive the Orders, steps toward the Priesthood. It is always a very moving celebration. The Purification itself is a moving Feast. We can imagine the Virgin Mary coming to the temple with the Child Jesus and St. Joseph, bringing the offering—doves—and meeting on their way the old man, Simeon, who acknowledged his God in this little Child carried by the Virgin Mary; and as it had been promised to him that he would not leave, would not die, without seeing his Savior, he took Him in his arms and sang this magnificent hymn, Nunc dimittis servum tuum Domine—Now thou dost dismiss thy servant, O Lord, according to thy word in peace. Our Lord, Who is the King of all things, entered into the temple carried by the Virgin Mary. It was His temple because it was the temple of God. He did not come there as other creatures, to give themselves to God. He was God. He came to take possession of His temple, which belonged to Him, and He had a right to all the honors which were given in this temple to God Himself. And you, my very dear friends, who are going to be tonsured in a very few moments, you shall also enter in the temple of God. You shall enter by the tonsure; you are indeed going to receive the cassock and the tonsure but these two things are very distinct; indeed, one can receive the religious habit, yet without receiving the tonsure. There are in holy Church diverse families: the two principle families are the family of the simple faithful and the family of the clergy—the laity and the clergy. Among the laity there are also two families: there is the family of those who destine themselves to remain in the world, to found families, Christian families, and there are those who give themselves to the Good Lord, who consecrate themselves to God as religious, monks or nuns, though they do not participate in the sacred Orders. They receive the religious habit, they pronounce the vows of religion, totally consecrate themselves to God, and dedicate themselves in a very particular way to their neighbor, yet, they do not belong to the clergy. Only those who are tonsured belong to the clergy. One enters into the clergy by the tonsure. This is the Tradition of the Church. Once one is tonsured, then, one can accede to the Minor Orders and, later, to the Major Orders. Certainly, the decisive step shall be taken at the moment of the subdiaconate, but to receive the tonsure is already a promise to go to the altar—to ascend to the altar. It is, therefore, a very important thing for you, my very dear friends. You know that from the moment you receive the tonsure—the Pontiff shall say this during his last instruction—you are accountable to the Church, you belong to the clergy of the Church. You are no longer subject to certain laws that are for the lay Catholic. You can say, my very dear friends—and, I think, this is the main thought that you should have today: “I do not have the intention to remain among the faithful to found a family. I want to give myself to God for my whole life; I want to serve Him and I hope, one day, to become a priest.” Moreover, you are not like the monks, at least not as many of them who enter the different orders and have made their religious profession but have not become clerics; no, this is not your intention. You wish to ascend the degrees of the altar. Now, what is your responsibility? What responsibility do you take in front of the Church, in front of God, in front of the faithful, in front of the religious who are not clerics? What is your obligation to holiness, to go in the way of perfection that you are entering? Are you more or less engaged in the way of perfection than those that found Catholic families, than the religious who enter diverse orders without becoming priests? Tell me! I think that this obligation to holiness is greater, is more incumbent upon you by the very fact that you enter the clergy, and that you want to become priests. Greater even than for those who pronounce the vows of religion and who are not clerics, than the faithful who remain in the world to found a Catholic family. You obligation to holiness is greater. Why? Because your condition is different. The Catholic who does not enter into a religious society, who does not enter the clergy, this Catholic has an obligation to pursue holiness because of his Baptism, because of his Confirmation; he must fulfil the promises of his Baptism: I attach myself to Jesus Christ for always, I renounce Satan, his scandals, his sins, and I attach myself to Jesus Christ for always. This is not a promise in vain. It is important; the priest says this when he puts the white veil on the head of the child and then when he gives him the candle through the intermediary of his godfather or godmother; he says to them, “serva Dei mandata—keep the commandments of God,” “Receive this white robe and carry it unstained to the judgment seat of Our Lord Jesus Christ, so that you may have everlasting life.” Here you have the obligation that the Catholic makes for his whole life. Therefore, even if he remains in what is called the “world,” he is in the world but he is not of the world, he has an obligation to come and offer himself at the Holy Sacrifice of the Mass, but to offer himself through the intermediary of the ministry of the priest. He cannot himself go up to the altar and offer the Sacrifice of his family, of his goods, of what he has; no, God has willed that there be priests who participate in the Priesthood of Jesus Christ and who be intermediaries between Him and the faithful people. The religious who pronounce the vows of religion engage themselves even in a more solemn way than the faithful, in front of the Church and in front of God. Pronouncing the vows of religion, they engage themselves in a public and official way, acknowledged by the Church to practice the holiness of the three vows of poverty, chastity and obedience. This is what constitutes a religious: he has made as profession of holiness. This is true. In spite of the fact that the obligation undertaken by the religious by pronouncing his vows is grievous and great in front of the Church and in front of God, however, he is still not allowed to go up to the altar and offer the Sacrifice, because he is not a cleric, because he is not a priest. He does not participate in the Priesthood of Our Lord Jesus Christ. Now, the cleric, that is, he who intends to participate in the Priesthood of Our Lord Jesus Christ, engages himself to holiness by his very function. It is no more the matter of a promise made in front of God, in front of Heaven, in front of the Elect of Heaven, in front of the Church, to profess holiness, but his very function is one of holiness because he participates in the Priesthood of Our Lord Jesus Christ. To be a priest and not to search for holiness is a contradiction in terms. The priest must essentially be holy because of his function, because of the Order that he receives. Every admonition the bishop gives on the occasion of each ordination recalls this exigency. You, my very dear friends, who received the Orders of Lector and Porter yesterday, you remember well that the bishop told you: you must give the example by your life; you must sanctify the faithful by the example of your life, not only by your words, not only by your functions, but by the example of your life. And the same is true of every ordination, and much more by the priestly ordination. This is very important; it is a very profound commitment. It is inadmissible that a priest does not search for holiness, and thus does not seek to be separated from the world, as Our Lord Jesus Christ, does not seek to be detached from the goods of this world, does not seek poverty, chastity and obedience. Even if he does not make a solemn profession in front of the Church to search for these virtues essential to holiness, nevertheless he engages himself to follow Our Lord Jesus Christ to perform the most important act which Our Lord Jesus Christ performed here below: his Sacrifice. We have said that the religious pronounce vows of religion, that is, vows that bind them to God, that elevate them towards God, that place them, in a certain way, in eternity, already blessed, united with God by the vows of religion. However, I say it once more, they cannot perform the principle act of religion, the essential act of religion, which is the Sacrifice. In this Sacrifice, all the acts of religion are summed up: devotion, contemplation, adoration; but all these acts of religion which are a part of the virtue of religion are nothing compared with the Sacrifice. As St. Thomas says, the Sacrifice can be offered only to God, because we can make a total gift of ourselves, of what we are, make the sacrifice of what we are only to the One who has given us these things and not to a creature. We may have a certain devotion to some creatures, in a certain measure, a kind of adoration, but we may not perform the act of Sacrifice in front of a creature. This is inconceivable. The Sacrifice is reserved to God. This is the reason why the Sacrifice of Our Lord Jesus Christ is the supreme act, the central act, of all His life. All His life was directed towards His Cross, and then, it is from His Cross, that all goods flow upon mankind unto eternity. And this is what you are going to perform, my dear friends, the act of Our Lord Jesus Christ. It is not another act, another sacrifice, you shall be alter Christus.Offering the Sacrifice of the Mass you are no longer yourself; you act in the Person of Christ, you shall open heaven in a certain way and make the most marvelous, the most extraordinary, gifts come down: God Himself in your hands! You hold the Holy Trinity in your hands, and it is you who, by your words, open heaven so that the gifts of heaven come down and be given to the faithful. And you alone are able to do this. Even if one of the faithful tries to pronounce the words of consecration, nothing particular would happen on the altar; even if a monk who is not a cleric pronounced the words of consecration, there would be nothing on the altar more than bread and wine. When you become priests and you pronounce the words of consecration, God comes down, the Holy God comes and takes the place of the substance of bread and wine, and thus you can give God to the faithful. This is what a priest is. And now, how can you tell me that you do not have the obligation to be holy, as Jesus Christ Himself was holy? Is He not on the Cross the Model of Poverty? Could He give a greater example of poverty than the one He gave on His Cross? Could He give a greater example of obedience than the one He gave on the Cross, “obedient unto death”? Could He give a greater example of chastity than by his virgin Body lacerated by the flagellation for all the sins of the world against chastity? This is the example that Our Lord Jesus Christ has given to us. We would not follow Him, we would not imitate Him, and we would like to offer His Sacrifice? No, my dear friends! Today, receiving for the first time this sign of detachment that the tonsure is, sign of abandonment of the things of this world in order to attach yourself to Our Lord Jesus Christ anew, take with your whole heart, with your whole soul, with your whole strength, the resolution to pursue holiness. Holiness is not a little thing, it is not a mere word; it is a reality. This holiness will have to be practiced in your life, in the life of your seminary and after the seminary. I take the occasion of the presence here of many of our dear confrères, who are already in the ministry and who have a little experience, some two years, some five years, some ten years, some already fifteen years of ministry....May they also on the occasion of this ceremony, think about what they promised at the moment of their ordination, about what they longed for during their seminary years, and ask themselves if they realize every day what they have promised. There may be need on certain points to see whether some efforts should not be made to practice better poverty, to practice better chastity, to practice better obedience. We must get away from the world, we must separate ourselves from the world. Tepidity is what has lost so many priests. One wants to be a priest and still wants to be of the world. One wants to enjoy what those who have remained in the world may enjoy, those who are not clerics, who have not made a profession of religion. These priests want to be both priests and men of the world at the same time. This is not possible. This is against the very essence of the priesthood. The priest is a man detached, the priest is a man poor, a man chaste, a man obedient. Let us strive in this period of the Church when priests have precisely lost all these priestly virtues, these religious virtues, these virtues that make real holiness; they have abandoned them and have called themselves common men. We want to reform the priesthood and this was the reason why the seminaries have been founded. It is useless to found seminaries if we follow in the ways that have lost these priests. It is useless, we are losing our time. Why have these priests been lost? It was not big actions; it was the slow abandonment of priestly virtues. You know it, no need to give details, to enter into the particulars. The life these priests were living in general, unfortunately, before the Council, prepared them for the failures and the faults that have happened since the Council. And, if ourselves, after having justly desired to fight against these abandonments, against this decadence, we follow in the same ways, we shall reach the same results; it is evident. It is useless to think that we are stronger than our predecessors. If we take the worldly ways, in the middle of the world, we shall fall—there is no other outcome possible, and we shall do no good around us. On the contrary, we must be an army, an armada, which pleases Our Lord Jesus Christ, which follows Our Lord Jesus Christ, who fights this crusade that Our Lord wishes to wage today, and through which we must convert the world, through which we must be a light in the world. With the grace of God we are already a little of this through your apostolate, my dear friends. Through your dedication, through your zeal, through the example of your holiness, you have brought back many souls. How many testimonies of persons lost, disoriented, abandoned, tell us their gratitude, give us their thanks for you, my dear friends, for the apostolate that you accomplish! Therefore, I beg you not to stop doing such an apostolate. It is time to think about it in order to remain what we are, what we want to be, and what Our Lord Jesus Christ wants us to be, simply what the Church wants that we be. All the catastrophes throughout the history of the Church came in general from the clergy. The clergy had abandoned the way of holiness, had abandoned the Way of the Cross; and it is in the measure that the clergy abandoned the Way of the Cross, in the same measure society was degraded. And there was need that the Good Lord raised founders of orders and founders of religious congregations to give back to the priests the way of holiness. We hope that the Society is precisely willed by God so that priestly holiness remains in the world. Let us hope that the Society shall be a light in the world, and also the other foundations which through the grace of God have understood with us the necessity of living the precepts of Our Lord Jesus Christ, the precepts of the Gospel, and who are here present. I don’t want to name them but they also are searching for holiness, are searching for an example of prayer, of abnegation, of renouncement, of the Cross. This is our raison d’être [reason for being], my dear friends; if we lose this, we lose our raison d’être. If we lose the way of holiness we lose the very reason of our existence. Lastly, let us ask the Blessed Virgin Mary, she who was the Mother of the High Priest, who brought Our Lord to the temple, that she remain with us, my dear friends. She is certainly there; the Virgin Mary accompanies you and when you shall present yourself in a few moments with your cassocks to ask the bishop to bless them, Mary is with you. What she did with her Divine Son, she is doing for you now, hoping that you shall be “other Christs.” In the Name of the Father, and of the Son, and of the Holy Ghost. Amen.